London: An 81st-minute Gareth McAuley goal prevented Liverpool from claiming top place on the Premier League table, as they defeated West Bromwich Albion 2-1. Needing a two-goal win to move above leaders Arsenal, Liverpool took a 2-0 lead through Sadio Mane and Philippe Coutinho, but McAuley's strike left them in second place on goal difference. 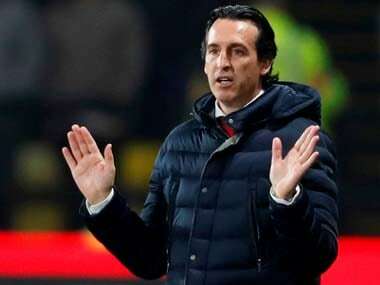 Arsenal had earlier been held to a 0-0 draw by Middlesbrough, while fourth-place Tottenham Hotspur played out a goalless stalemate at Bournemouth. 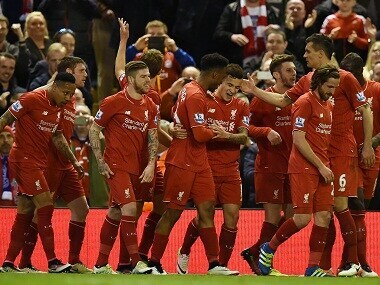 "I'm really pleased with the performance," Liverpool manager Jurgen Klopp told Sky Sports. "It was unbelievably difficult against West Brom. You have to always concentrate. They are so dangerous at set-pieces. But I think it would have been kind of a joke if we hadn't won today. It was unbelievable, how we played." Mourinho makes his return to Chelsea with Manchester United. Klopp made one change to the Liverpool team held 0-0 by United last Monday, with the fit-again Adam Lallana returning to the starting XI at the expense of Daniel Sturridge. Roberto Firmino took over from Sturridge up front and played a key role in Liverpool's neat 20th-minute opener, crossing for Mane to volley home after Coutinho's dummy had freed Emre Can. Mane turned provider 15 minutes later after a sliced clearance by visiting goalkeeper Ben Foster, slipping Coutinho in, who cut inside two defenders and scored at the near post. West Brom centre-back McAuley halved the deficit late on, volleying in from close range at a corner. Arsenal, 6-0 winners over Ludogorets Razgrad in the Champions League in midweek, were seeking an eighth successive win in all competitions. But Middlesbrough came closest to breaking the deadlock in the first half at the Emirates Stadium when Gaston Ramirez curled a 21st-minute free-kick against the post. cent possession, but you could have lost the game. That is modern football." 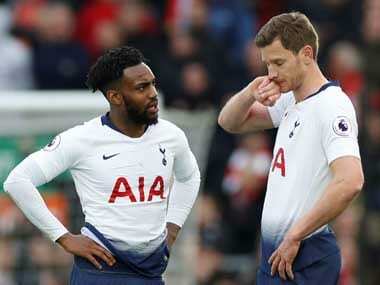 Tottenham extended their unbeaten start to the season to nine games — something they last achieved in 1990 — but squandered an opportunity to go top in a 0-0 draw at Bournemouth. Both teams hit the woodwork in the early stages, Spurs goalkeeper Hugo Lloris diverting Charlie Daniels's shot onto the bar and Erik Lamela clipping the post from distance. "We had control, but we didn't create enough chances to score," said Spurs manager Mauricio Pochettino. "I think we need to be pleased in the end because it's one point more, one clean sheet, but it's true for us to be contenders we should be winning the games like today." Champions Leicester City did not need Jamie Vardy as they won 3-1 at home to Crystal Palace to climb to 12th place. With Vardy starting on the bench after a groin problem, strikers Ahmed Musa and Shinji Okazaki struck either side of half-time at the King Power Stadium. Christian Fuchs sealed victory in the 79th minute, the Austrian left-back netting from distance with a sensational strike to register his first Leicester goal. Yohan Cabaye got a consolation goal for Palace. "That was our best performance so far this season," said Leicester manager Claudio Ranieri. "It was the shape and model of last season and we concentrated on doing our job." 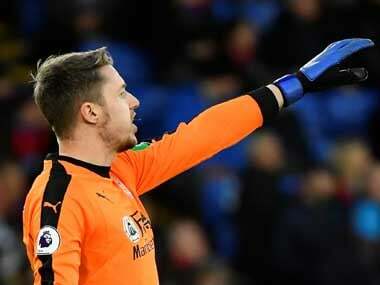 Sixth-place Everton spurned a chance to make ground on the leading sides in a 2-1 defeat at Burnley, who took a 39th minute lead when goalkeeper Maarten Stekelenburg's blunder gifted Sam Vokes a tap-in. Yannick Bolasie equalised just before the hour with his first Everton goal, but Scott Arfield struck at the death to condemn Ronald Koeman's men to a fourth league game without victory. Xherdan Shaqiri scored two stunning goals — the second a free-kick — as Stoke City won 2-0 at Hull City to climb out of the relegation zone at their hosts' expense. 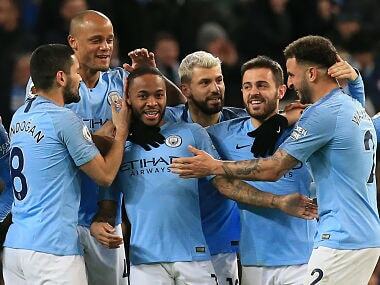 win at their London Stadium. Swansea City stayed second from bottom after Bob Bradley's first home game as manager concluded in a 0-0 draw with Watford.